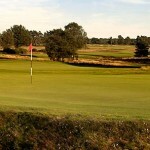 Walton Heath Golf Club is a located just outside Walton-on-the-Hill in Surrey, England. The golf course was founded in 1903 and open in 1904 and comprises two 18-hole championship courses, the Old and the New. First to be opened was The Old Course and as of 2009 is 7,462 yards in length and is well known for it’s heather which covers most areas of the rough. The New Course was originally a 9-hole course back in 1907 but was later extended to an 18-hole course by the end of 1913. It is now a 7,026 yards in length and also boasts large amounts of heather to make it even tougher! Both the Old and the New were designed by Herbert Fowler who was later to become a designer of a number of courses in the United Kingdom and the United States. The courses have held many a competition including the US Open qualifying rounds. But is better known for hosting the 1981 Ryder Cup and hosting five editions of the European Open between 1978 -1991. It also hosted the Senior Open Championship last year. This entry was posted in Blog Post, Great Golf Courses and tagged golf, golf club, Golf coaching west London, Golf Equipment, golf lessons, Golf Lessons London, Golf Lessons West London, golf tuition, Golf Tuition West London, james irons golf, Junior Golf Coaching, Ryder Cup, Walton Heath. Bookmark the permalink.